Cambodia’s Jewish community has been faithfully served since Rabbi Bentzion and Mrs. Mashie Butman arrived on the scene in 2009. Currently, they are abroad, providing themselves and their six young children some much needed time family time, and we are here attempting to fill their very large shoes. Last week, we received a phone call from the Israeli Embassy in Bangkok, Thailand. Mr. Yuwal Waks, whose official title is ‘Deputy Chief of Mission, Political and Public Affairs’ (which means that he is second in command at the embassy), had some business in Phnom Penh, and was interested in visiting the Chabad House. Of course, we responded that we would be thrilled to host Mr. Waks, and immediately got to work on the logistics. In anticipation of our important guest, we spent most of the morning preparing—making sure the rooms were tidy and presentable, and overseeing the lunch that the Cambodian chefs in the Chabad restaurant were whipping up. We were excited but also apprehensive—this visitor was in a different league from our typical easygoing Sabra backpacker! But as soon as we met Mr. Waks we relaxed. He was easygoing, soft-spoken, and respectful. We began with a grand tour of the 8-story building which houses a synagogue, preschool, restaurant, social hall, offices, mikvah, and more. Our visitor was extremely impressed with the building and the full gamut of Jewish amenities the Butmans provide to Cambodia’s Jewish community of locals and tourists. Over lunch (which thankfully turned out delicious!) we had a spirited discussion about some Jewish and Chassidic philosophical concepts. At one point, Mr. Waks mentioned that he had grown up on a secular kibbutz, and had never had the opportunity to put on tefillin. “I would like to do so, would that be possible?” he inquired. Chabad boys are trained from a young age to help others with mitzvahs, including tefillin, and we log countless hours in that pursuit. We almost always are the ones doing the asking, so being approached like this made for a rare and happy occasion. 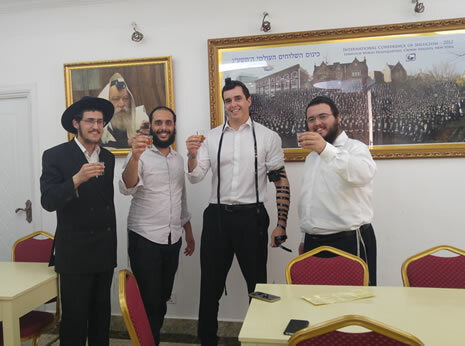 About an hour later, after we had finished lunch and our conversation, we brought out our tefillin and explained the process to Mr. Waks, who had about a dozen questions for us about every detail, until he was wrapped up, and turned quiet, introspective. We gave him time to pray and when he was ready we removed the tefillin and celebrated together. “This is your Bar-Mitzvah, mazal tov!” we toasted L’chaim in honor of the occasion. We’re quite certain that when Yuval Waks turned thirteen, back on the kibbutz under the hot Israeli sun, he could never have dreamed that the day would come when he would celebrate his Bar Mitzvah nearly 5000 miles away at the Jewish hub of Phnom Penh, Cambodia.